The year 2015 marks the centennial of the Panama-Pacific International Exposition (PPIE), the San Francisco world’s fair that celebrated the opening of the Panama Canal and the city’s reconstruction following the great earthquake of 1906. The grand exposition covered 76 city blocks and boasted national and international pavilions showcasing innovation, industry, and the arts. At the heart of the PPIE was one of the most ambitious art exhibitions ever presented in the United States, encompassing more than 11,000 paintings, sculptures, prints, and photographs, in addition to a significant array of public murals and monuments. To mark this anniversary, Jewel City revisits this vital moment in the inauguration of San Francisco as the West Coast’s cultural epicenter. The landmark exhibition at the de Young reassembles more than 200 works by major American and European artists, most of which were on display at this defining event. Learn more about the city of San Francisco's full PPIE 100 program. 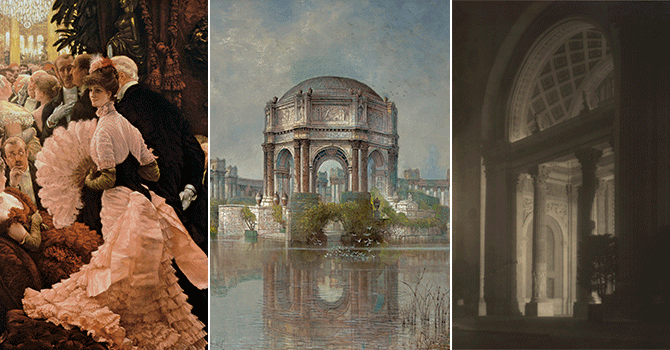 Share your experience of the exhibition with us on social media @deyoungmuseum #JewelCity. This exhibition is organized by the Fine Arts Museums of San Francisco. President’s Circle: Lisa and Douglas Goldman Fund. Benefactor’s Circle: National Endowment for the Arts. Supporter’s Circle: Marianne H. Peterson. Community Partner: Ghirardelli Chocolate Company. Media sponsor: San Francisco Chronicle. This exhibition is supported by an indemnity from the Federal Council on the Arts and the Humanities.